A Finished Coin Quilt – Progress! I made this coin quilt a couple months ago as a part of the coin quilt piece-along, and I finally finished the quilting and binding! Just wanted to prove that I have been sewing a little bit lately. I quilted straight lines around each column of coins, and then more lines around the entire piece. I pieced the back with a larger cut of Bell Bottoms fabric I had in my stash and a couple extra columns of coins for the backing. I think the back looks cool, but in hindsight, I would have had made the front wider with those extra coins and put a solid green in the middle section. I still love how this one turned out! I love your coin quilt! I have never made one but am inspired after seeing yours. 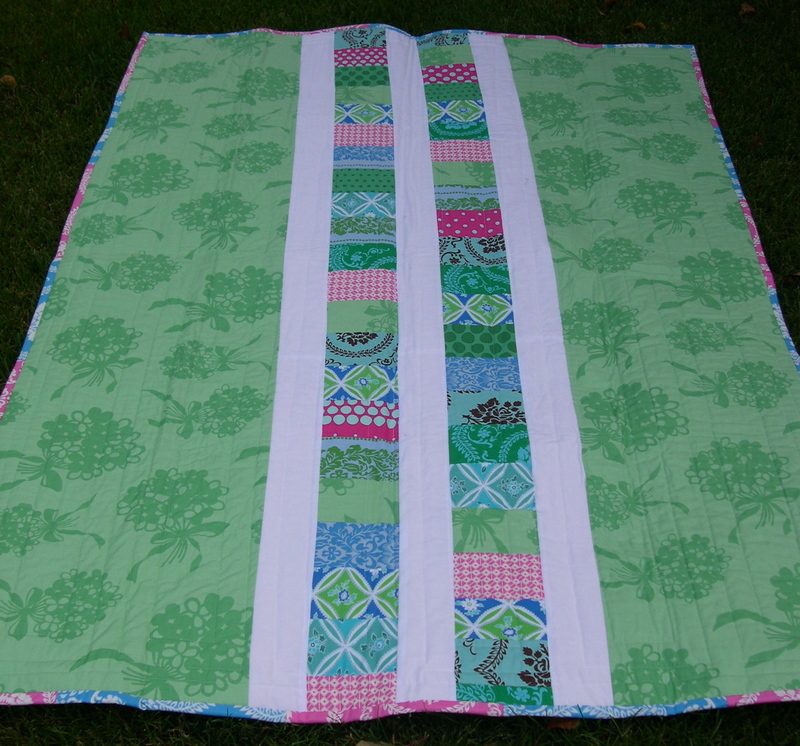 Nice job with the quilting…love it! This is really cute! 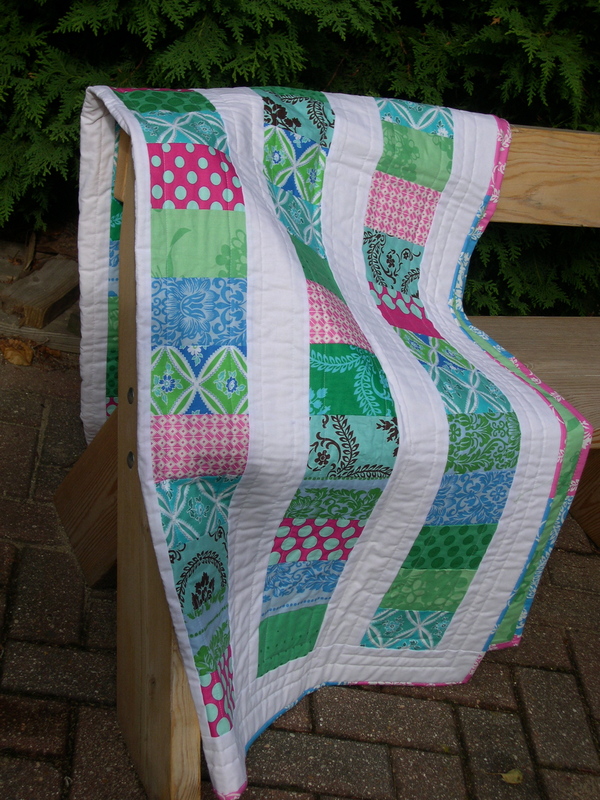 The quilting really looks good with this design. And I like the pieced binding. Feels good to make some progress on something occasionally, doesn’t it? It’s very pretty. I love the pieced binding. The greens make it so minty fresh! I just love it! What a great coin quilt! I really want to do one…one of these days! brilliant!! May I blog about this beauty Terri? This turned out devine!! Do you have bigger pics you can send me?? Terrific Terri – love the colours, the scrppy binding, the design – just lovely! I can see why you may have wanted it wider (more of a good thing) but I truly love the back! Nicely done. 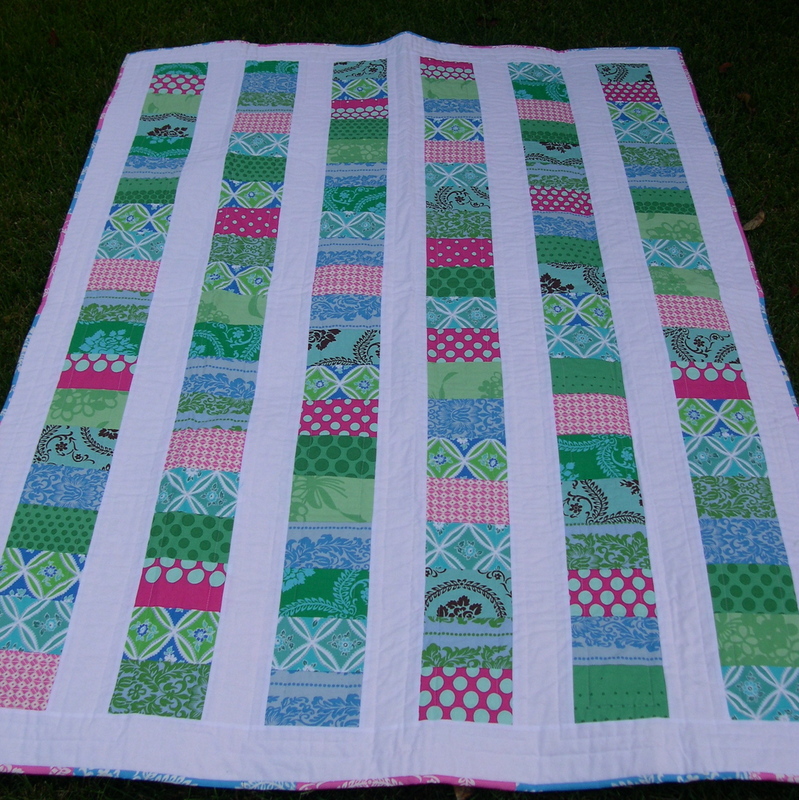 I am in love with coin quilts and yours is just perfect. I love how you did the backing. Just absolutely beautiful! I too, love how this turned out! I also love that you are featured on the designer’s blog, that’s a pretty great compliment! Yea Terri! It looks wonderful!